Many of us who are involved in astronomy on a professional or amateur level feel that part of our mission, or duty, is to do education and public outreach. This can be showing kids who stop by your house on Halloween the Moon through a telescope, participating in a star party showing hundreds of people celestial wonders through telescopes, writing articles for your astronomy club newsletter, writing an astronomy blog or giving talks on astronomical topics to clubs, schools or after school groups like Boy Scouts. I think an argument can be made that educating the public in math, science and critical thinking, in this technological and information based age we live, is critically important. But, we'll save that for another time. Today, I just want to let you know about some great resources for information that can be used to do outreach activities. These resources are getting better all the time. 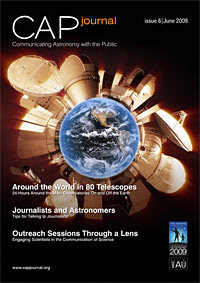 "Public communication of astronomy provides an important link between the scientific astronomical community and society, giving visibility to scientific success stories and supporting both formal and informal science education. While the principal task of an astronomer is to further our knowledge of the Universe, disseminating this new information to a wider audience than the scientific community is becoming increasingly important. This is the main task of public astronomy communication — to bring astronomy to society." The June 2009 issue has an article in it that I found very useful in preparing for my next round of talks in Chicago and New York in early August. 'Live Casting: Bringing Astronomy to the Masses in Real Time' by Pamela Gay, Fraser Cain et al discusses ways to do live blogging and podcasting and videocasting from astronomy conferences and conventions. They spell out the advantages and pitfalls and give the reader a complete list of what you should bring to make your attempt a success. 1. Place flashing red LEDs at the base of each your telescope's tripod legs. This helps to prevent people from tripping over your tripod legs. 2. Alternatively, place split rubber traffic cones over the ends of your tripod legs, for the same effect. 3. If you can afford it, use large 2 inch wide angle eyepieces, as they are easy for the novice viewer to look through. 4. Wrap the barrels of your eyepieces with reflective tape. This helps the viewer to find the eyepiece. 5. keep a small red flashlight handy to point it at the eyepiece, so the viewer can find it. 6. Place a walker frame underneath your telescope. People naturally grab the handles of the walker, instead of grabbing the eyepiece. 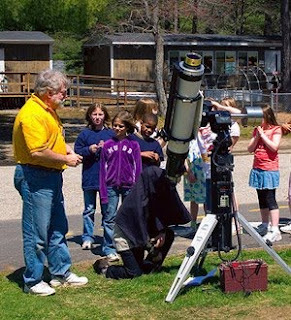 7. place a low folding stepladder at the base of your telescope so the children can reach the eyepiece. Cover it with reflective tape for visibility. make sure you move it out of the way when adults view through the telescope. 8. If your telescope is a goto, announce when the telescope is slewing so that people will not be trying to look through it or are too near it when it moves. 9. Allow the viewer to adjust the focus if necessary so they can see clearly. Many people do not realize that they need glasses and look at the world, and into telescopes, with blurred vision. You can readjust the focus for the next person. 10. Bring stuff to give away. NASA is great for supplying such things as bookmarks, decals, and photographs, especially if you are working on their behalf. (Solar System Ambassador, Saturn Observation Campaign volunteer, etc.). 11. Be enthusiastic and expressive about astronomy. Your enthusiasm can be infectious to the viewers. Another great source for news items and interesting space elated topics is the website Portal to the Universe. The Portal has news feeds from all the major space agencies, missions and observatories and feeds from hundreds of astronomy and space related blogs. Links to the latest vodcasts and podcasts are featured daily as well as the live feed of the Sun from the SOHO satellite. Featured in the side bars on the home page are the NASA, Astronomy, Lunar, and Amateur 'picture of the day'. Portal to the Universe also has a Facebook page. To see what is going on in the International Year of Astronomy, check out their Cornerstone Projects webpage. Many of these projects also have their own Facebook pages, where you can get in touch with people from administrators of the projects to fellow enthusiasts who are interested in sharing what they know and have with you. 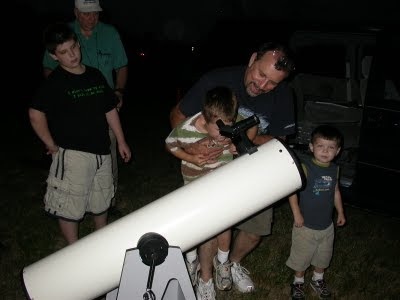 One of my favorite education and outreach efforts is the AAVSO Citizen Sky project. This is the biggest citizen science project ever designed. The general public is invited, encouraged and trained to help observe and analyze one of astronomy's great mysteries, the eclipsing binary Epsilon Aurigae, whose once every 27.1 years eclipse has just begun. I am involved in several of the AAVSO's education and outreach efforts. I coordinate the AAVSO Speakers Bureau which supplies speakers for astronomical societies, clubs, star parties, schools and other events. AAVSO also has a library of PowerPoint presentations available to you to use in doing your own astronomy talks. We also have a 'filter blog', the AAVSO Writer's Bureau, which supplies monthly articles from a collection of bloggers on variable stars, supernovae, novae, gamma-ray bursts, stellar evolution, exoplanets and related stellar topics for astronomy club and society newsletter editors to use free of charge. These are just some of the resources I know about because I am personally involved in them or use them to do outreach myself. If you know of other good resources, please leave the names, descriptions and a url in the comments section below. Great post, Mike. A new free resource your readers may enjoy: the astronomy group on FunnelBrain. Members collaboratively create and share online astronomy flashcards.